Robofest 2013 Michigan Regional Championship Info. Don Ridler Field House (No. 2 building on the LTU Campus Map) Use parking lot "F" or "C". Parking is free. Robofest coach accounts have been set to browse-only (no modification) after qualifying competitions. You may *not* add new team members. Editing team information is only allowed for correction of misspelled names and updated team/robot pictures. You must contact Chris Parker at [email protected] by April 20 if your team information is incorrect or to upload team/robot photos. Bring completed Consent and Media Release Forms for all participants, including team coaches. All participants and coaches must submit a new Consent and Media Release Form for the Robofest Michigan Regional Championship. Only Exhibition teams need poster boards to introduce the robotics project. Other competition teams do not need a poster board. There is no check-in fee for the Michigan Regional Robofest event. If your team has not paid the team registration fee ($50) for your Qualifying Competition, it must be paid at check-in at the Michigan Regional Championship. Credit cards are not accepted. Cash or check payable to LTU only. There will be 5 official playing fields and 7 practice fields. Make sure the robot meets size requirements. Each game robot must have a team-ID label. Each team will be given maximum 4 minutes for official presentation using a wireless microphone (See the Tentative Schedule above). The 4 minute presentation should include team and member introduction, robot introduction, and demonstration. Teams must be at the table during the time slots specifed in the schedule. One 6ft table covered with black vinyl will be assigned for each team. If your team needs any special setup, please let [email protected] know in advance. As noted in the Robofest top level rules, there will be silent judges who will not identify themselves as judges. Exhibition teams must demonstrate and explain their projects to all the visitors during the official times. Registered spectators will decide People's Choice Awards. Wanted: Michigan Regional Championship Volunteers!!! If you are available, please register at robofest.net/rms/appPages/volunteerPages/index.jsp?siteID=334. If you know someone who might be interested in Robofest volunteer positions, please let them know of this opportunity. Judge position needs an invitation code. If you would like to be a Judge, please email to Dr. Sarah Burcon, [email protected] . 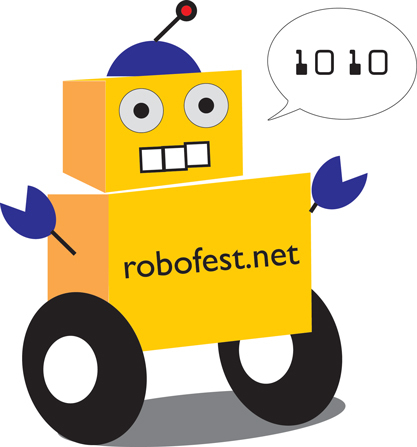 Robofest needs volunteers like you to help the event run smoothly. There will be free raffles for registered PCW Judges. Spectators will decide Exhibition People's Choice Awards. Register and obtain a form to vote for your People's Choice Exhibition when checking-in before 9:25am. Official Robofest T-shirts and Robofest promotional items can be purchased at the Field House. We need to recognize students' achievement in science and engineering fields. Each team's achievement is remarkable and needs to be celebrated! If you have any media contacts please call them to publicize your team's achievements. Please call TV stations, newspapers, and other news media and invite them to come to Michigan Robofest Championship.